To The Ends Of The Earth--Why Should Christians Care about the Jewish Roots of Christianity? For many Christians, the Jews and Judaism seem like the last place to learn anything about Christianity. Christianity and Judaism appear to be opposites. For many centuries, it sounded heretical even to suggest that Jesus, Peter, and Paul were Jews. Yet this is the historical reality: that Christianity worships a Jewish Savior, whose Jewish disciples founded a Jewish religion in Israel. Jesus and his disciples spoke the Jewish language (Hebrew), they read the Jewish scriptures, they attended Jewish synagogues, they taught using the teaching techniques of the Jewish religious teachers of their day. These same disciples wrote most of our Christian scriptures, both the Old and the New Testaments. Jesus himself was a Jew of the line of David (Matt. 1:6). Paul was a student of the famous Rabbi Gamaliel (Acts 22:3). What’s important about the Jewish Roots of Christianity? Everything. Because without the Jews and Judaism there would be no Christianity. And since Christianity started among the Jews, we must understand our Jewish Roots to understand the Bible correctly. Without them we are liable to misunderstand much of what the Christian faith is about. Why is it that Christians know so little about their Jewish Roots? Beginning in the mid-2nd cent. AD, Gentile Christians began to reject Jewish Christians, calling them heretics. Why this change of heart? Because these Jewish Christians continued to live as Jews, just as Jesus, Peter, and Paul had done. Think about that for a minute: Gentile Christians began to reject their Jewish brothers and sisters in the faith, the spiritual and physical descendants of the apostles, because they continued to live in the same way that Jesus and the apostles had done. Why did they consider it wrong that they lived as Jews? In part it was a misunderstanding of the Bible's teachings about Jews and Gentiles in relation to the Law of Moses. But it was also because of anti-Semitic beliefs brought by Gentiles into the Church. These anti-Semitic beliefs and the actions that followed polarized Christians and Jews for centuries. Horrible persecutions and atrocities were done, mostly by Christians against Jews. The most horrible of all took place in recent history: the destruction of 6,000,000 Jews in Europe — the Holocaust. These were not military casualties. 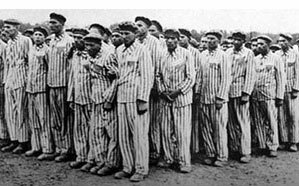 They were civilians that were detained and killed, many of them in gas chambers. Who did this horrible thing? The Nazis. And who were the Nazis? Mostly Germans. Germany was one of the most Christian nations in the world: home of Martin Luther, the father of the Protestant Reformation. Why would a Christian nation do something so horrible? In part, because of the hatred that pastors and priests had long been preaching against the Jews. It's one thing to recognize that a person or a group of people are sinners: The Bible says all have sinned and fall short of the glory of God (Rom. 3:23). But to call for the destruction of an entire ethnic group because of the sin of their ancestors in the distant past is something completely different. It's a direct contradiction of the Bible, which says that each person is responsible for his own sin (Deut. 24:16, 2 Chron. 25:4, Eze. 18:20). Jesus commanded us to love our enemies (Matt. 5:44): how much more should we love the Jewish people, through whom our faith came to us (John 4:22)? The recognition of sin and disobedience in a person or a group should inspire the desire to lead them into God's grace and forgiveness, not to destroy them. Yet the church often took the opposite point of view: it counseled, or at least condoned, the destruction of the Jews. Yes, the Jewish leadership participated in this crime: they brought Jesus to Pilate. This made them accomplices in the act, and gave them a moral responsibility for what followed. And there were individual Jews in the crowd that day shouting, "Crucify him!" and "His blood be on us and on our children" (Matt. 27:23,25). These are regrettable actions. But they do not give the Jewish people sole responsibility for this murder. 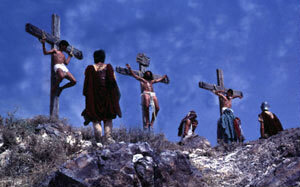 The Bible teaching is rather that "all have sinned," all are responsible for the death of Jesus (Rom. 3:23). The Jews could have killed Jesus. They almost did several times: once in Nazareth by pushing him off a cliff (Luke 4:29, see our teaching The Messianic Judge), twice in Judea by stoning (John 8:59, 10:31). But they never actually brought themselves to do it. The Gentiles had no such reservations. They killed Jesus the same morning he was delivered to them, and they have killed many hundreds of thousands, in fact, many millions of Jews since. Anti-Semitism corrupted not only the Church's morality, but also its beliefs. Pagan ideas quickly replaced Jewish and Biblical ones in the Church's teaching and practice — and the original Biblical ideas were forgotten. Many of these "Gentilizations" of the faith can still be found both in traditional churches and in many Protestant churches, too. For example, in the Middle Ages the Roman Catholic Church taught (and still teaches today) that something called the Beatific Vision will be the reward of the righteous in heaven: that they will eternally contemplate this "beautiful vision" of God. This is a completely spiritual, that is to say, a completely non-physical eternity with God. And it sounds suspiciously similar to the pagan Roman belief of a heavenly eternity for those that are worthy. Similar ideas have been advocated by many Protestant groups. So why is this a problem? Because the original Jewish and Biblical view of eternity is quite different. The Bible teaches an actual, physical resurrection of the body: a body that will be just as physically real as the bodies we live in today. Not only that, this physical resurrection implies a physical place to live — the earth of the millennial kingdom (Rev. 20:4ff), and the new earth and new heavens of eternity (Isa. 65:17; Rev. 21:1ff). Both were originally understood to be real, physical places, in which the fullness of life, including physical life, will be restored to us. This idea of an actual, physical resurrection was laughed at by Gentiles in the time of the apostles (Acts 17:32), and is still widely rejected by their descendants today. But among the Jews, it was so important that to deny it was to become a heretic, denied a place in the world to come (Mishnah Sanh. 10:1). Jesus and the apostles accepted and taught this doctrine as a central belief, which was greatly strengthened when Jesus himself rose physically from the dead: not as a spirit, but in a real, physical body that could be touched and that could eat food (Luke 24:36-43; 1 Cor. 15:4ff). Being in touch with our Jewish Roots is not just a matter of accurate understanding. It’s also a matter of prophetic destiny. Israel is not just another nation: Israel is God's plan for the nations. Israel is God's answer to a sinful and fallen world: a holy people, raised up by God as a testimony to the nations; a lighthouse pointing the way to the one true God. "Remember that you were at that time without Christ, being alienated from the citizenship of Israel and strangers to the covenants of promise [made with Israel], having no hope and in the world without God. But now, in Messiah Jesus, you [non-Jews] who once were far away were made near by the blood of Messiah…. So, therefore, you are no longer foreigners and strangers, but you are fellow-citizens [of Israel] with the holy ones and members of the household of God" ( Ephesians 2:12,13,19 ; see Ephesians 2). Through Messiah, we who are Gentiles (non-Jews) have been added to the nation of Israel. We, the wild olive branches, have been grafted into its rich root (Romans 11:17-24). Yes, other branches—many of them—have been broken off because of unbelief. Physical Israel (the Jewish people) is still largely in rejection of its Messiah. But God’s plan and purpose—Israel’s destiny—are unchanged. Faith does not just bring us to a particular religious philosophy, or even just to the right God. It brings us into a specific relationship of obedience, a covenant, with God, which incorporates us into a nation—the nation of Israel, with all the loyalties and interrelationships that this implies. This nation is not limited to the modern nation of Israel in the Middle East, nor even to the Jewish people, but includes those from every nation, people, and language that submit themselves to Israel's Messiah (Rev. 5:9). Yet at the same time, it is essentially a Jewish nation, built on the foundation of Abraham, Isaac, and Jacob, and all those that followed them in faith, including the Messiah himself (John 4:22). We need to align ourselves spiritually with this believing Israel, including the Messianic Jewish believers of today. And because the day is coming when national Israel will accept its Messiah, we must also identify by faith with the nation of Israel and the Jewish people (Rom. 11:26). This does not imply, as some teach, that we must all become Jewish, living under the Law of Moses. Within the spiritual nation of Israel there are many callings (1 Cor. 7:18-20). As in many countries, those who live in different regions fall under different jurisdictions with different requirements. The kingdom of Messiah is like the historical kingdom of David, who ruled over many Gentile nations in addition to Judah and Israel. These Gentiles were not brought under the Law of Moses. Yet all, Jew and Gentile alike, were subject to the rulings of the king. This is just a small taste of why the Jewish Roots of Christianity are so important. Without them, without an accurate historical understanding of our Jewish origins, Christianity is less than Christian. How can we get back to our Jewish Roots? It isn't easy. We must be willing to confront centuries of tradition as well as modern misunderstandings. But it's the only way to recapture the original clear light of the gospel. Updated 2/9/18. Copyright © 1999, 2006, 2008, 2011, 2012, 2018 by Jeffrey J. Harrison. All rights reserved. Originally posted as "Why Should Christians Be Concerned About Israel?" 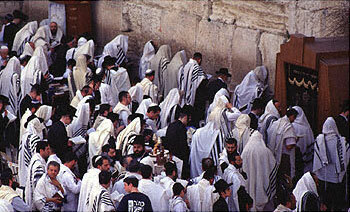 Photos of the Western Wall and the Crucifixion by the author. Please do not copy without permission. Permission granted for classroom use and Christian religious instruction.